After a total *DISASTER* in the computer department, I am finally back online! The motherboard on my main computer decided to give me a very hard time... three capacitors blew up and that was the end of my computer! I was *more* than annoyed... the computer wasn't all that old and a well known brand name. But I heaved a sigh of relief at none of my data being lost! Doing backups on my external drive made a difference too! The only problem was... I had to find a computer *somewhere* running XP (I had always refused to upgrade to Vista) in order to access it. It took a couple of days for hubby to track one down with our local computer guy... who was great.. he switched the drives and I was back in business. I flipped the switch and then came the shocking realization I had lost all of my software programs! Fortunately I had the CD's for some of them (and have most of them now re-loaded) but a lot of programs I had downloaded off the web were lost. Needless to say, it has been a frustrating and maddening two weeks getting back to this point. To calm my jangled technology nerves, I whipped out my clay and began to play!! I have been wanting to cover a needle tool hubby made for me a couple of years ago out of a heavy darning needle and a piece of dowel. I use it all the time... and not just for claying. After all that use, it was looking pretty grubby!! It's the greatest little tool for punching holes in leather, in cloth for putting in grommets or getting a sewn buttonhole started, cleaning those tiny ridges in my clay gun, poking holes in cardboard or paper... oh I could go on and on!! Want to make one yourself? 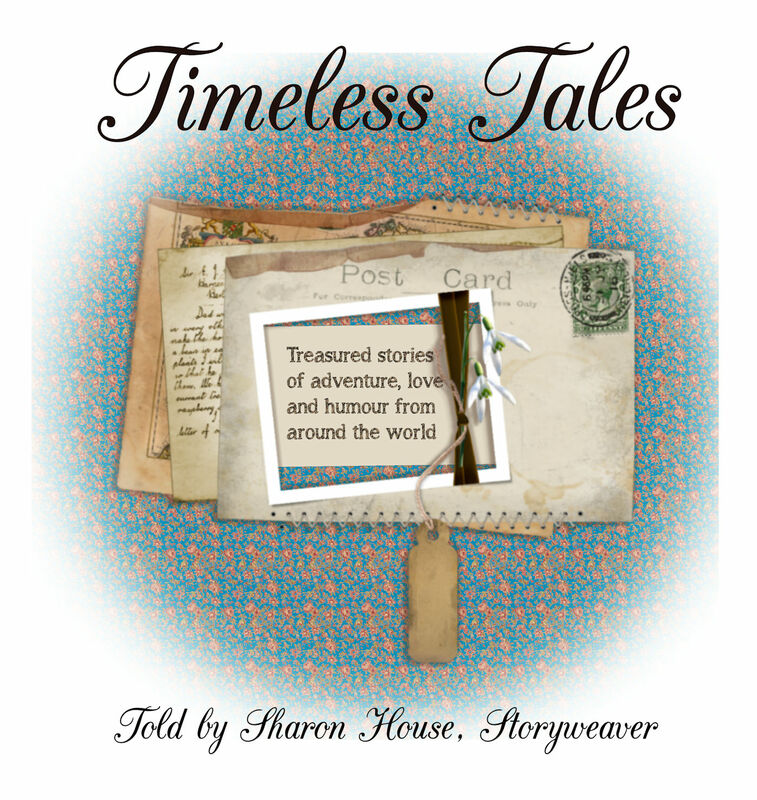 Just get a heavy darning needle, drill a hole in a 4" piece of 3/4" doweling that will fit the darning needle and glue it in with some heavy carpenter's glue. Cover it with clay, make a little bead for the end (so you don't poke yourself by accident) and you're done! Take a look at this photo. Yep, it's my initial! Can you guess what it might be? 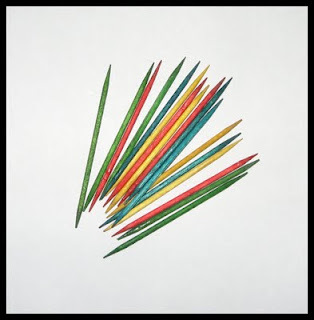 The mystery thickens with some colourful "pick up sticks"
Here's what's neat about this "tool": it won't fall over in the oven (even in a convection oven with all that hot air swirling about) while the "cocktail" toothpicks hold the beads while baking. 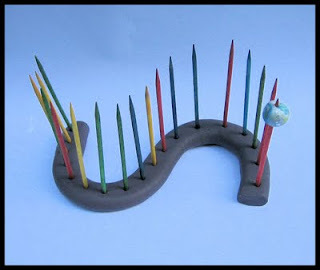 You can remove the toothpicks and once you have sanded your beads (if they aren't textured), you can put them back on the toothpick, dip or glaze them and set them back into the holder to dry. If you happen to lose or break one of the toothpicks, you can simply replace it with another one! All you need to make it are some cocktail toothpicks and some scrap clay. 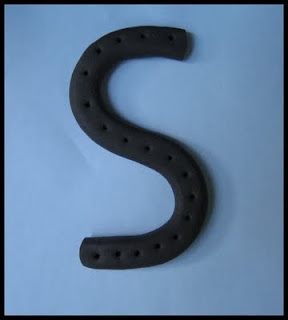 Form the clay into an "S", poke your toothpicks into the clay (leave them there while baking the "form"), bake the clay at 275 degrees for about 40 minutes (depending on the thickness of your clay). Remove it from the oven while hot (I use an "Ove-Glove" in my clay room for handling hot clay coming from the oven) and immediately remove the toothpicks. Let it cool, then put the toothpicks back into the holes in the form. You have to remove the toothpicks while the form is hot otherwise they will be very difficult to remove without breaking! Another use for this tool is using it as a holder for painting small "stuff" or when you are making little embellishments to add to ATC's, cards or other art. P.S. Have any of you who have blogs had as much frustration as I have had in "transitioning" the Google apps that can't automatically be moved to Google's new structure? I was ready to tear my hair out...what a process... and I am not sure that I have even got it right. I consider myself pretty web savvy but boy I found it confusing! If anyone has some good tips, I'd love to hear from you! Thanks for sharing. Love your tools! Thanks for sharing your creativity! Your 'stamps' are SO clever. 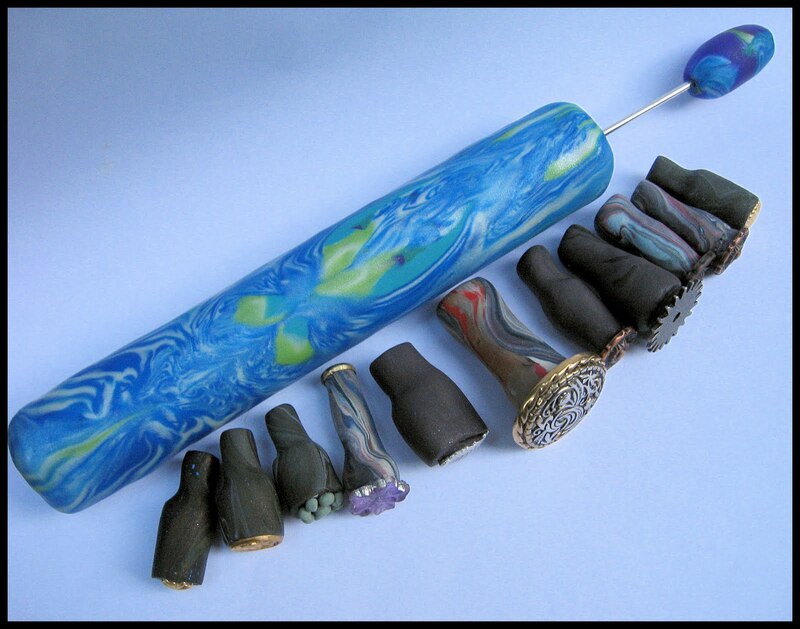 multi-purpose, all-in-one bead baker tool. This is one of the most original and practical ideas I have ever seen.It is certainly not as cumbersome as one of those expensive bead baker tray things and much more functional. 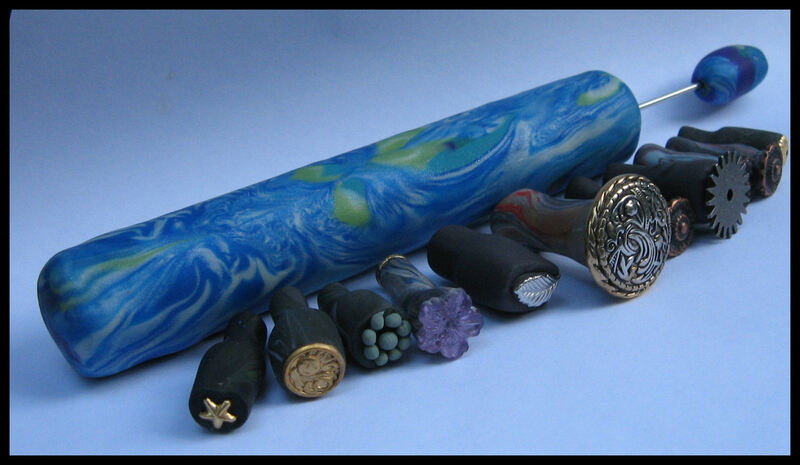 I plan to make one of these today and expect that I will use it every time I make beads.